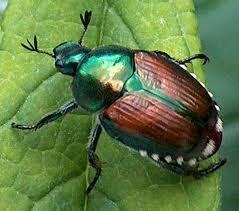 Japanese beetles are beautiful, but deadly for lots of garden plants. Their lovely copper bodies glisten and gleam in the morning sunlight. But they are eating the life out of your beans, cucumbers and other delicious garden plants. To stop them, you need to go to war! 1. Check your garden plants in the cool of the morning, several times a week. Bring a bucket of soapy water. If you spot a copper-colored beetle, especially on a bean plant, cucumber plant, or other plant with soft, green leaves, it's likely a Japanese beetle. Hand-pick it and throw it in the bucket of soapy water. Look on the undersides of leaves on that same plant, and on nearby plants, as these beetles feed in groups. If you see a "skeletonized" leaf, with the green parts chewed out and only the leaf veins remaining, a bunch of them have been there and ruined your plant! 2. If you can't stand the idea of hand-picking them, lay out an old white bedsheet on the ground, and then gently shake garden plants so that any bugs in them will fall onto the bedsheet. Japanese beetles will instinctually "drop" to get away from danger, so they will likely fall right onto your sheet. You can pick up the corners of your sheet and dump them into a bucket of soapy water, or, if you have adult supervision, into a pan with gasoline! Just be sure to dispose of it properly. 3. Last, but not least, because we want to garden organically and not use powerful chemicals that can hurt other plants around us, let's try this "bait and trap" method. In a bowl, dissolve ¼ cup sugar and 1 package of dry yeast into 1 cup of water. Stir. Now stir in one mashed banana. It should be goopy. Pour this goop into an empty, washed-out gallon milk jug. Leave the top off. Go out to the garden where you saw Japanese beetles, and with a trowel, or hand-held garden shovel, dig a little trench in the soil. Lay the milk jug in there and press the soil back around it so that it'll stay put in high winds. Again, leave the lid off. As this mixture ferments, it'll make a smell, and the beetles won't be able to resist crawling in there to check it out. But they won't be able to get back out, so you've trapped them! AHA! Take that, you beetles! Keep in mind, though, that the war against harmful bugs in the garden won't be won in a day or even a year - it's a war that will continue for as long as gardens grow!